Opting Out: My Story in Taking the Plunge! As someone who has fought the battle against corporate education reform for the past four years, one would think I would have been the first parent in line to opt my children out of high-stakes testing. Surprisingly, it took me a while to realize how important it was to have my children opt out of OAKS and SBAC testing. Opting out of state testing wasn't something I decided lightly. A lot of issues, thoughts, and questions ran through my mind as a parent: Would my child feel isolated and alone? Would my child miss out on education opportunities such as Advanced Math if they didn't test? Would my child's lack of a test score make life hard for his/her teacher? Would opting out hurt my child's school? Would I have to justify my family's decision to the school or district? Would my child or myself be seen as an irritant or inconvenience? Was I just making too big a deal out of this testing stuff? As high-stakes testing and Common Core continued to erode my children's well-rounded and quality education, I became more upset that nothing was changing. The state continued to disinvest and ignore funding opportunities that made a positive difference in the lives of students such as PE, music, art, library, sports, home economics, wood shop, foreign languages, project-based learning, and smaller class sizes. Instead the focus was on spending money on longitudinal databases to house student data such as test scores, expensive new testing, and mandating Common Core. And I wondered: how did I, and thousands of Oregonians before me, receive a quality public education? How did teachers assess students without fancy-schmancy newfangled shiny tests or more "rigorous" (yet developmentally inappropriate) standards? How did students, parents, school board members, principals, superintendents, and legislators know school was working? We had homework, did projects and research papers, read novels, textbooks, and primary sources. We went to the school library to learn how to find resources, take notes, and navigate information. We took teacher-created tests tied to unit learning. We debated, learned geometry, algebra, created science experiments, and took field trips. Class sizes weren't out of control. We had opportunities such as band, drama, sports, art, foreign languages, speech/debate, government, economics, health, home economics, journalism, and personal finance. We turned out just fine and many of us graduated to go on to college or a trade school, start a job, or a family. Some of us didn't know right away what we wanted to do--and that was okay. Sometimes that takes time, trial and error, seeing the world, or having other varied life experiences. What we had were opportunities. What we didn't have was the pressure at an early age to pass tests or else be labeled a failure. I wanted the same for my children, and I didn't see any leaders stepping up to make the testing madness stop. So, one day, I was tired of worrying. Tired of being in limbo. 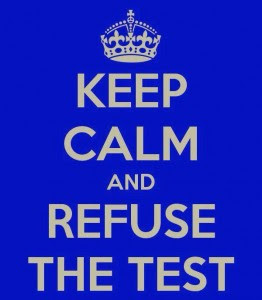 Tired of seeing my kids stress out or question the value of the test. I was tired of fighting against corporate reform, yet remaining part of the system by not opting out. I was tired of thinking maybe we could wait it out and it would go away like most trends. But instead of fading away, corporate reforms and testing doubled down and blinded many to the damage their policies were having on our schools. So as a parent I said "enough already!" I was a bit scared to hand in my opt out form that first time, but once it was done, it felt so incredibly freeing and empowering! And I knew my kids would be all right because I could see the valuable feedback they received on their homework, assignments, and class projects and tests. Their grades and the information provided by their teacher who knew them well as a person and individual was much more meaningful to me than any high-stakes test data point. It didn't matter to me how my kids did versus other kids. I wanted them to learn for themselves. Sadly, with the state and federal government continuing to push the threat of losing federal money if too many families choose to opt out, a new dynamic is coming into play: pitting families against each other and guilt tripping parents into testing so their school doesn't lose some money. How is that good for a school community? My child should not be encouraged (ahem! blackmailed) to test so that another group's test data is supposedly determined to be valid. My family should not be guilted into testing so that the school keeps its state success/failure label. My family should not be persuaded to test so that a school doesn't lose money. These are bully tactics by the state and federal government. This is wrong. It makes opting out more important than ever. Communities should work together not against each other. It will take more parent voices to keep up the pressure to make the changes we want in order to get rid of high-stakes tests. In not allowing the data to determine if our schools and children are a success or failure, we can open up the possibilities to focusing on what authentically matters. We go back to a time where we focused on kids not numbers and data. I tell my story in hopes that others will take the opt out plunge. In doing so, we put power back in the hands of parents, communities, and schools. We are the experts, not some high-stakes standardized test. If you have a story you would like to share, please send your stories to OregonSOSinfo@gmail.com. Oregon SOS can publish your stories anonymously or with your name--whatever you feel more comfortable doing. Others need to know they are not alone. Thinking of opting out, here are some things you can do: Check out optoutoregon.org for more questions/answers, download an opt out form here and bring it to your child's school now as schools will start testing soon, and tell your friends. Our public schools need us. Teacher Input: What would it really look like? It’s an election year and we’ve just been provided with a plan through the Governor’s office asking for nominations to the new Governor’s Council on Educational Advancement. The Council’s mission is to provide oversight to programs managed and funded through the Network for Quality Teaching and Learning established by the legislature. The Network is in charge of and funds various programs including: Common Core State Standards, teacher evaluations tied to high-stakes standardized testing, professional development, teacher mentoring, best practices for closing the achievement gap, early learning partnerships, recruitment of a diverse teaching force, and English Language Learners’ success. Will educators finally be listened to, or will they be provided the usual “seat at the table” where they once again share in the poison wine? · Meetings should take place at a time where teachers can actually attend without having to plan for a substitute and incur personal costs and unpaid leave. · The majority of voting members of the 15-member council would be currently practicing educators, meaning those who deliver instruction. · The chair of the committee would be one of those educators. The chair would be actively involved in setting the agenda and presentations would have to be approved by the voting members. · Voting members would not include representatives of any stakeholder organization that receives funds through the Network. 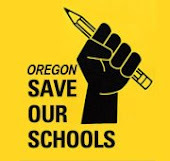 Oregon Save Our Schools is committed to giving teachers and parents a public voice and would like to publish more parent and teacher opinion pieces about this and other topics on our blog. If you would like a piece published (with your name or anonymously) please send your piece to us at oregonsosinfo@gmail.com.